Vietnam’s patchy record of media freedom was in the spotlight again this week when a meeting of international donors urged the country to expand press liberties. Foreign representatives at the Third Dialogue on Anti-Corruption in Hanoi expressed their concern about last month’s arrest of two well-known local journalists, fearing that it could set a “bad precedent” for the future reporting of corruption cases. Nguyen Van Hai, 33, and Nguyen Viet Chien, 56, are in jail and under investigation for their reports on one of the most notorious scandals in Vietnam, where millions of dollars of public funds were used to bet on European football matches. The scandal, dubbed the PMU-18 case, broke in 2006 and led to the arrest of a number of high-ranking government officials, including a vice minister of transport. The minister, Dao Dinh Binh, was forced to resign. Newspapers were praised by the authorities at the time for their detailed coverage of the scandal. No-one paid attention to the fact that long before the investigations were completed, the newspapers had already accused the jailed officials of all kinds of wrong-doing and described them as villains. The case took an unexpected turn this March when Vice-Minister Nguyen Viet Tien, who was already on bail, was cleared from any criminal responsibilities and exempted from prosecution. Vietnamese media showed images of the victorious Mr Tien appearing from the Supreme Prosecutor’s Office. He vowed to make a come-back. Less than two months later, Mr Hai and Mr Chien, from Tuoi Tre and Thanh Nien newspapers respectively, were arrested for “inaccurate reporting and abuse of power”. A police general who allegedly provided information to the journalists was also prosecuted but not detained. Public speculation ran rife over the apparently powerful connections of Mr Tien, who was once a rising star in the regime. Vengeful or not, it seemed the state apparatus had got the upper hand. Local media, which devoted detailed coverage to the journalists’ detention, fell silent after three days. It is thought that the powerful ideological department of the Communist Party has ordered newspaper editors not to write anymore about the topic. Two newspapers that continued reporting on the subject reportedly received a warning from the authorities. Even when visiting US Assistant Secretary of State David Kramer raised concerns over the arrests, his words were omitted in the local press. Ironically, while agitating about the media’s role in the fight against corruption on the occasion of the recent Anti-Corruption Dialogue, all newspapers chose to ignore their colleagues’ names. But the arrest of the two journalists remains one of the hottest topics of discussion on online forums and among the public, especially because of the fact that Tuoi Tre and Thanh Nien are two of the best-selling newspapers in Vietnam. People reached out to foreign media organisations, such as the BBC, to express their anger and frustration. According to Vietnam’s criminal law, the two journalists can be held for four months before being brought to court. If found guilty, they face prison terms of one year as a minimum. 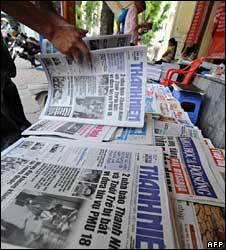 But there are some who think that it is about time that Vietnamese journalists reconsider their working ethics. 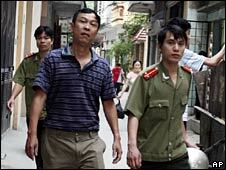 Hong Anh, a Hanoi resident, said he was shocked when he first heard about the detention of the journalists. “And they nearly never apologise for false reporting,” he added. Poet Bui Chi Vinh, who worked for Tuoi Tre newspaper during its early days, was even stronger with his words. In an interview with the BBC, he said: “Anti-corruption has become a kind of modern-time mantra. Everyone is against corruption in Vietnam nowadays. “It can be used to cover up wrong-doings,” he argued.